This TV series takes a unique approach to true crimes and answers a simple question: What if a murder victim could tell you about their final moments? The show focuses on some of the most shocking murder cases in the United States. Each episode examines one case from start to finish, taking viewers inside the murder from the victim’s point of view. A mixture of documentary and drama, the voices of the dead come to life through scripted recreations and interviews with real-life witnesses, prosecutors, law enforcement, family and friends. Final Witness is shot on location around the world and infused with an indie-band soundtrack and cinematic style. When Nina Reiser doesn’t show up for a dinner date, Ellen Doren, Nina’s best friend, is curious. When Nina fails to pick her kids up from school the next day, Ellen knows something is terribly wrong. Five days later, Nina’s minivan is found abandoned on the side of the road. In it, police find her purse, cell phone and three bags of groceries rotting in the back — but there’s no sign of Nina. When investigators dig into this soccer-mom’s past they are surprised by what they find: a messy divorce, a tangle of tempestuous affairs and two lovers vying for her favor. Nina Sharanova grew up in St. Petersburg, Russia. An OB/GYN, Nina is a go-getter and a beauty, turning heads wherever she goes. In 1999 she meets an American entrepreneur and hotshot software designer Hans Reiser who is in Russia on business. He’s brilliant and ambitious; she’s intellectual and exotic. After a whirlwind romance, Nina and Hans marry and head to Northern California to start their life together. It’s all passion at first and they have two children right away. But soon there is trouble. Hans wants more kids; Nina wants a career. Hans is away nine months out of the year trying to run his business; Nina is alone and lonely. The relationship slowly disintegrates and Nina hopes that she and Hans will be able to end things amicably. But when Nina files for sole custody of the children, the real trouble begins. Accusations fly from both sides: infidelity, child abuse, Munchausen’s-by-proxy, immigration fraud. Nina just wants to move on — to divorce Hans, to extricate herself from these messy relationships and to focus on the one thing that matters to her: her kids. But before any of that can be resolved, she goes missing. When investigators finally sort out the lies from the truth and put the pieces of the puzzle together, they learn just how much a mother will risk for her children and they discover what happened to Nina Reiser. The DA tries to prosecute her computer-genius husband for her murder, but with minimal evidence and no body, it’s an uphill battle. However, when a surprise witness takes the stand and tells what he saw the night Nina disappeared, it forces the killer to reveal himself and leads authorities to Nina’s body. On October 30, 2008, Hans Reiser attempted to appeal his second-degree murder conviction and sentence due to ineffective assistance of counsel, amongst other claims. Trial judge Larry Goodman denied the request on November 13, 2008, stating that Reiser had waived his right to appeal as a condition of his plea. The children of Nina and Hans Reiser filed a wrongful death suit against their father, suing him for $25 million. The civil suit was tried on July 16, 2012, and after just three hours of deliberation the jury awarded the children $60 million. What do you think? 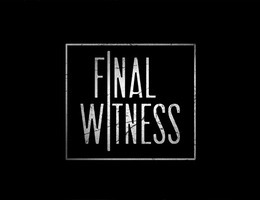 Do you like the Final Witness series? How does it compare to the other true-crime shows? Are you sorry there won’t be a second season? Please bring this show back! Please, please, please!!! I beg you to bring this show back!!! It remains my favorite…period! I lived this show!!! Why did it have to end so soon???? i wish they would bring it back my family and me love this show. it is so different from other crime shows make you get close to the vitim. We watched all the episodes on the ID channel. This is one of the best true crime shows ever produced. The music, actors, and voice overs are excellent. The only true crime show with production values near as good is IDs ‘A Crime To Remember’. The basic premise of final witness has been brought back in the show ‘Stolen voices buried secrets’. The title was changed this year to ‘I was murdered’. Only the production values are not as good as ‘Final witness’. We miss this show. I watched all of the first season’s episodes and I keep hoping to see more. A great show; I like its unique approach. Please, please do not cancel! I love the show ! Bring it back it was one of the better crime shows! I love this show…please don’t cancel. Bring it back and needs for episodes. I loved this show–please bring it back for another season! this is one of the better shows out there. please keep it going! Love this show, please bring back more episodes!!! I Love this series. Hope to see a new season soon.